Pleasures from the Page: SOL 6/31: Ten Picture Book Favorites! SOL 6/31: Ten Picture Book Favorites! 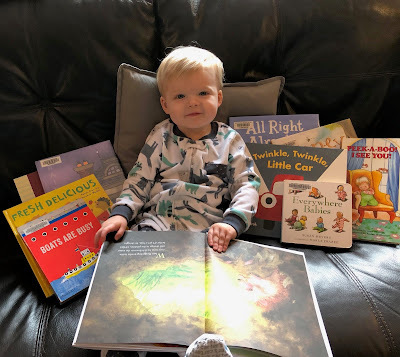 Today's slice brings you ten picture book favorites (for this week) from my two year old grandson, Jack! These are the books we've read over and over again this week. It's someone funny . . . It's my funny Honey Bunny." Hedgehog Needs a Hug by Jen Betton - I love the lush illustrations of the forest and its animals. Hedgehog needs a hug, but can't find an animal brave enough for his prickles. Until he happens upon another woodland friend who feels just like him! After the hug, these final words: "And they both felt better." Fresh Delicious: Poems from the Farmer's Market by Irene Latham & illustrated by Mique Moriuchi - We had fun reading and rereading this one yesterday and giggling over these lines from our favorite poem, "Corn." Beep! Beep! Go to Sleep! by Todd Tarpley & illustrated by John Rocco - Jack loves this tale of three robots who finally manage to put their boy to sleep. He loves to read it to himself and chants "Beep! Beep! Go to sleep," as he turns the pages. And we love to look for the mouse on every two page spread. All Right Already! A Snowy Story by Jory John & illustrated by Benji Davies - I requested this one from the library when we were looking for books about the snow. Little did we know then that February would bring us so much snow! A delightful tale of grumpy Bear and his exuberant friend, Duck. Rainstorm by Barbara Lehman - When you live in the Pacific NW, you need a few books about rain. This wordless picture features a mysterious key and a young boy's adventure on a rainy day. Boats Are Busy by Sara Gillingham - We discovered this one in the board book bins at the library. It provides detailed pictures and information about 15 different boats, and Jack can name all of them. Twinkle, Twinkle Little Car by Katie Dopirak & illustrated by Mary Peterson - This one came highly recommended by Nancy Stewart who leads our grandparents' group. It was so loved that I had to buy a copy for Jack's 2nd birthday. Everywhere Babies by Susan Meyers & illustrated by Marla Frazee - This is a new-to-me title, published in 2001. It's perfect for Jack who's preparing to become a big brother this month. Honey by David Ezra Stein - Bear comes out of his den after a long winter, hungry and remembering honey. "Warm, golden, sweet, clear, slowly flowing, spicy, aromatic, sparkling with sunlight - 'Honey!'" The very end of the book has these words: "A sleepy bear sat and remembered the summer, and thought how good it had been." This is a book that I would have loved to use as a mentor text with my 6th graders for our Goodbye Summer writing pieces. And yet, it's also a book that two year old Jack loves. Such is the power of story! So sweet! That Jack is a lucky kid to be surrounded by so many books (and awesome grandparents)! Well isn't he just the cutest thing ever?! What a lucky little man to be surrounded by books and people who encourage him to jump into the adventures they hold! Happy reading! I had to peek. I do love Irene's Fresh Delicious, and Honey is a favorite, too. I don't know the others, will note them in case I need gifts! Love that picture, Ramona! This is a great list and I must admit I did not know Everywhere Babies....but that big brother to be will soon know! Happy waiting! SOL 28/31 & Poetry Friday: Our First Poem! SOL 26/31: Six Days and Counting! SOL 25/31: Messages from Our Devices! SOL 23/31: Rome in Three Days! SOL 22/31 & Poetry Friday: How to Find a Poem! SOL 21/31: Come Meander with Me! SOL 19/31: Chatting with Jack! SOL 18/31: So Many Books, Never Enough Time! SOL 16/31: Inspired by Wordsmithing! SOL 13/31: My Lucky Streak (Part 1)! SOL 12/31: My Lucky Streak (Part 3)! SOL 10/31: Double Digits, Finally! SOL 4/31: Trip to Italy - The Rome Airport! SOL 3/31: So Many Good Books! SOL 1/31: Eight Things About Me!